Well, it's only 22 days until my next Doctor's appointment. It can't get here soon enough. The weather was a record high here Sunday, 67deg, and I couldn't run. I bought an orthodic insert & New Balance 926's that my Dr. "prescribed", and have been pain free since I started wearing them. I must say, the 926's are an ugly shoe. I bought them in black, since the white's were even uglier. I haven't run in over a week, and when I checked the scale, I had put on almost 9 lbs., thanks to not running & the non stop picking at the holiday food & cookies. Well, I went to my Orthopaedic Doctor today, to find out what the pain in the ankle was. While I do have a touch of arthritus, it is not the cause of the discomfort. I have Posterior Tibial Tendonitis. What is posterior tibial tendonitis? Posterior tibial tendinitis is an uncommon problem of the foot. When this tendon is inflamed in posterior tibial tendinitis or if the posterior tibial tendon ruptures, it can cause serious problems. Most commonly, patients with posterior tibial tendinitis complain of pain in the inside of the foot and ankle, and occasionally have problems associated with an unstable gait. So whatever that is, bottom line is.... rest, anti-inflammatory meds, and orthodics for my shoes for support... or else! My Doctor said I have caught the early stages, which is a good thing, and I'm about the 5th marathoner he has seen this year, with this issue. With the proper rest, I should be fine, but if I where to continue to run, I have the risk of it rupturing, and that would be the end of my running. Sooo rest it is, I am not thrilled about that, and the early Spring Marathon is OUT..
(fyi... I was planning on the National Marathon in DC). So there is my early Christmas present, courtesy of my marathon training... overuse of some wacky thing called the posterior tibial tendon. Anyway.. that's the deal in a nutshell. I got in a 10 mile run on Sunday, before the Arctic blast hit us here in NJ. The temp was about 35deg with a slight breeze, when I started around 3:30pm yesterday. Luckily, the winds didn't pick up, until I was done. I ran a loop similar to one of my marathon training runs. It was my longest run since the marathon. I felt really good during the run. Funny thing, I just said to my wife, hey I'm going out for a 10 miler, and hit the pavement. It was pretty cool to be in good enough shape to just go run 10. No way was I doing something like that a year ago. Man what a difference a year makes. I kept a pretty steady pace, in the low to mid 8's the entire run. I feel if I could train, with how I have improved & felt after running Philly, and if the ankle could handle it, a 3:40 -3:45 time wouldn't be out of the question. I'm headed to the orthopedic Dr tomorrow to get the real deal on the ankle. Hopefully a little PT and I'll be ok. I sure don't want to be on the shelf. That appointment will make my decision on running a early 2009 marathon. 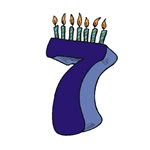 Earlier this week, my oldest son asked me to run seven miles on his seventh birthday. I told him it would be no problem for me to run for him, the only way I wouldn't run, was if my Dr. said I couldn't. I finally broke down, and went to see him on Tuesday. I had to get an x-ray of the ankle, and was waiting on the results. I got the results today. Well, the good news was there is no stress fracture or bone chip in the ankle., and they don't think it's muscular. They think I have some arthritis in there, from when I fractured it about 18 yrs ago. Funny, I run the marathon for arthritis, and low and behold, I have a form of it. I will be making an appointment with an orthopedic Dr. to have it looked into further, but the best news is I can run, and I can manage the pain with a compression sock on the ankle, and some Tylenol. So, after we picked him up from school, he opened his presents, and I was off on my 7 mile run. It was about 40deg out at 4:00pm, when I went for my run. You could feel the weather getting colder, as we have a storm headed our way, Friday. I felt really good, for not running since Sunday. I didn't have much discomfort in the ankle. Since I needed to run 7 miles, I did an out and back to Mercer County Park. There wasn't many people out in the park. I passed 1 person running, and another walking their dog, and that was it. I did come across a bunch of deer. I ran at a nice comfortable pace, an enjoyed it. As I was running, I was thinking of how quick 7 years went by, and what I was doing, 7 years ago, when he was born. At the time I was running today, he was just born. Man time flies. I hope next year, when he turns 8, I will be running an 8 mile run for him! Ya think he'll run 43 miles for me next year? Maybe I can get him to run for 43 seconds. And if my youngest wants me to do the same for him, I'll have a nice easy 4 miler next June! I wasn't planning on running today, but I was loafing around the house, the 1:00pm football games stunk, so I went for a quick 4.75 mile run. I just ran a nice comfortable pace. The past week, the ankle had been feeling much better, and it didn't bother me after yesterday's trail run, but it was "manageable uncomfortable", if that makes any sense. I got the wrap back on it, and we'll see. Other than the minor ankle pain, my wind and legs felt pretty good. Nice thing about running at 3:00pm today, was the weather. It was bright and sunny, no wind, and had warmed up to a toasty 48deg. I got up bright and early and headed out to Mercer County Park, to meet Bill Y., and the group I ran with on Thanksgiving Morning, to do some trail running. Now back to the trail run. It was a cold morning, with temps around 28deg. The course had some real muddy parts, with all the rain we got on Wednesday & Thursday. We even ran into a flooded part, around the 4th mile. It made it all the more interesting. I had wet toes for most of the run. You really have to be aware of everything around you, when you run the trails, it's real easy to roll an ankle. It's fun, and cool to run with a group. I bet there where about 10 of us out on the trails. We ran for about an hour, and it's a slower pace than I am used to, but it's fun to do, and it looks like we'll be running these trails in MCP for the next few Saturday's. If you are in the area, the more the merrier. We meet at 6:45am at the park entrance off Robbinsville Edinburgh Rd. I got out twice this week to run. It's nice to run without a schedule, but I have been starting to look at running a second marathon in early 2009. I have one on my radar, in late winter/early spring. More on that, when I decide what I am going to do. Well, I got out Tuesday and ran. I wanted to run the Hamilton Hangover 5 miler course, but I couldn't get to the park, to run in the daylight.. damn winter! I was close to Mercer County Park, so I ran the Run for Dad 5k course. I ran it casual. I wanted to get some miles in, and see how the ankle felt. Something is up with my right ankle, and hopefully it's just a strain, and not a stress fracture. I need to get it checked, but just don't want any bad news to interfere with my running. Anyway, I did the 5k loop in 23:29. Wednesday it was like an early spring day, with temps in the low 60's (it was in the high 20's on Monday), and on and rain. I got out in a mist, and it picked up later in the run. I ran a little over a 9min mile pace. I had planned to run a 5 mile loop, and somehow during my run, I must have hit the off button on the Garmin, and I didn't realize it was off, until I had a little over a mile left on my run. The garmin had me running 2.77 miles in 25:46, and I know I am missing at least a mile and a half. If that would have happened a few months ago, I would have been pissed, but with nothing on the line, ahh who cares! The weather this week here in NJ has been crazy! It started out with the temps barely hitting 30 on Monday, to a high around 65 on Wed, with rain Wednesday & Thursday, and heavy at times on Thursday nite. Winter will return this weekend. I think I am meeting the group from Thanksgiving, Saturday morning to go trail running. Having 2 boys at time of year is pretty fun! Here are our inflatables that have been up since Black Friday! The boys love these things. We even drive around the neighborhood looking at other people's displays. Yes, we have 5 of these, 3 in the front yard, 1 on our deck, and 1 in our garden. Oh and we have 3 little 4 foot ones inside our house that the boys display all over the place. 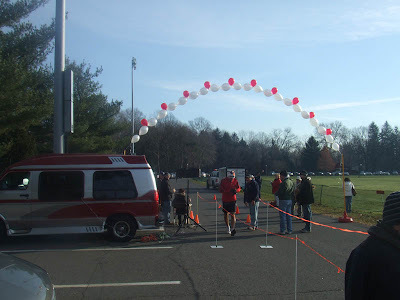 Today was the Run for the Holiday 5k, in Burlington,NJ. I met Shoreturtle & Bill Y, at the Dunkin Donuts, and carpooled to the run. It was a cold start to the day, in the 20's, and it felt it. I was excited to do the run, with Bill & Charlie. They are both really good runners, and seem to bring the best out in me. The last time we ran a 5k together, back in July, I PR'd, and with how I felt recently, I expected to today. Being a holiday run, there were a few recognizable faces in the crowd. I think we all know who the gentleman in the red suit is. I should have asked him for a healthy 2009 running season. I felt bad when I passed him around the 1 mile mark. I hope he doesn't give me coal for Christmas! You can see the world famous Larry the Lighthouse. The man has been spotted in a few books recently. He was in Dean's 50 in 50, for the NJ Marathon run. I gotta give him credit. I don't know how he runs in that get up! Well, since it is the Holiday season, we had to partake in the festive mood. Here we are, Shorturtle, myself & Bill Y., just before the start. Yes, I own just about every kind of FLYERS hat! The course had a few gradual hills, in the first 2 miles, but overall it was a nice quick course, mostly on the streets around Green Acres Park. We started on the right side, because I noticed that was were WPVI 6 ABC cameraman was set up. The first mile was a quick one at 7:06. I felt pretty good, except for passing Santa. The 2nd mile had the larger of gradual hills, and I caught a few runners who went out too quick. I did the 2nd mile in 7:14. I was still feeling pretty good, and picked up the pace for the 3rd mile. I passed a few more runners, and ran mile 3 in 6:53! Yea, I can't believe I had a mile that started with a 6! When I saw the finish line, I tried to kick that last little bit, as the clock slowly ticked, it was still reading in the 21 mins. I crossed the finish in a PR of 22.02. I was a bit disappointed to not break the 21 min mark, but considering I started the year running a 24:05, I am pleased that I dropped 2 minutes off my time. Charlie finished a strong 21:12, and set a PR. He also placed 6th overall, and 3rd in his age group. Here he is getting his age group medal & ski cap. Bill Y. finished in 22:25, 12th overall, and 4th in his age group. I finished in 22:02, set a PR, 10th overall and 3rd in my age group. It was the first time I got a top 3 medal. Charlie & I also got a Run for the Holiday 5k ski cap. And yes, there were more than 3 runners in my age group! The wife and I took the day off from work and went out Christmas shopping for the boys. We hit all the big box stores, and did some damage. We got some really cool stuff for them. I guess we shopped from about 10:00am - 3:00pm. When we got home, and unloaded the van, I wanted to get a run in before the rain came. All the reports called for rain here, starting around 5:00pm. I planned on a 6 mile out and back run from home to Mercer County Park. The weather was pretty nice, about 45deg, and cloudy. It had that feeling of rain coming. The wind was pretty calm, and that's always a plus! I wasn't out to set and land speed records today. I wanted to get some miles in, so I would be ready for the 5K race on Saturday. I ran nice comfortable miles, trying to keep a nice even pace. I felt pretty good. It seems it takes me a mile or so, for the aches to get out of the legs. Guess that's a byproduct of just running a marathon. I do think I need to have my Doctor take a look at the right ankle. It doesn't feel right. I'm sure it's nothing, but it has been nagging at me for the better part of a month now. Once I got going, and got into a flow, I added on a little loop at the park, and that pushed my 6 mile run, to a little over 6-1/2. I pushed it a bit that last mile. I am trying to make that the norm, and run my fastest mile as my last. Sure is nice to just get out and run for the hell of it! It was a bit windy out,when I ran later this afternoon. My best guess was a sustained wind around 20mph. It was rather warm, with temps in the mid 40's. I ran at Mercer County Park, and that meant that the wind was all over the place. Sometimes it was in your face, other times a cross wind, and even at your back. I am going to run my first 5k race since July, so I wanted to run a 5k, and see how the legs felt. Not running every other day is weird right now. I ran relaxed on the Thursday's Turkey trail run, so I wanted to push it for the 1st of my 2 5k's. When I started out on the 1st 5k, it took about a 1/4 mile, to get the legs and my wind going, but from there on, I felt good. I wanted to try and run this at a race pace, to see how I would feel, after months of longer slower paced runs. I clicked off the 1st mile at 8:04, and was on my way. Most of this mile, I had the wind in my face, and a bit of a windy uphill. The 2nd & 3rd miles, the wind was mostly a cross breeze. I was having fun, knowing it was a short run. The 2nd mile I ran it in 7:36, and again, not really hurting. The legs seemed to have rebounded nicely from the marathon. The last mile was my fastest.. that's always a good thing, and I clocked in at 7:10. That got me thinking. My fastest mile time, was way back in high school. I was a sophomore, and did a mile in 5:04. Now I know there is no way I could hit that mark today, but if I could run a 7:10, maybe a low 6:00min mile is in me. I might have to pick a nice day, and hit the track, to see what I could do. The last .11 I did in 48secs, for a 3.11 mile run of 23:40 (7:36min/mile avg.) Not too bad. My PR for a 5k was 23:22, which I did this past July, so maybe I can top that mark Saturday. I took it easy on the 2nd 5k. I ran it nice and comfortably back in 26:17 (8:25 min/mile). I thought for a second about busting out one of the miles, but thought better of the idea, and just ran relaxed. It was nice to get out and run again. It seemed like forever since I ran. I'm not use to taking 3 days off in a row.